(CNN) -- A high-ranking al Qaeda leader has called on China's minority Uyghurs to prepare for a holy war against the Chinese government. Security has been increased recently on the streets of Urumqi, Xinjiang's capital. "There is no way for salvation and to lift this oppression and tyranny unless you ... seriously prepare for jihad in the name of God and carry your weapons against the ruthless brutal invader thugs," Abu Yahia Al-Libi said Wednesday in a video on an Islamist Web site. He delivered his message in Arabic. The Uyghurs are Muslims in western China's Xinjiang province. Some Islamists refer to the region as East Turkistan. Al-Libi's proclamation was in reaction to the violence that has recently shaken Urumqi, Xinjiang's capital. 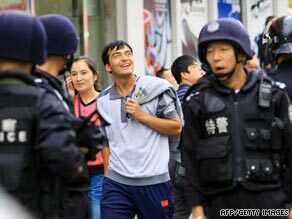 There, long-simmering resentment between minority Uyghurs and majority Han Chinese erupted into riots and left more than 200 people dead in July. The following month, a series of stabbings -- with syringes used as weapons -- added to the unrest. "What we saw and heard in the recent events in Turkistan was not accidental and didn't happen overnight. This is an intifada (an uprising) and a usual response to the decades of oppression, the organized cleansing and the systematic repression until the people had enough," Al-Libi said. "This was not the first uprising that the oppressed Muslim people carried out, because they keep grieving and struggling to preserve their identity against the aggressors." Chinese officials could not immediately be reached for comment Thursday. In his latest message, Al-Libi called on Muslims worldwide to support the Uyghurs. And he vowed that China will suffer the same fate that the former Soviet Union did when it invaded Afghanistan in the 1980s -- only to be thwarted by Islamist fighters. "To you, the state of atheism and obstinacy: You are coming to an end and you will face the same fate of the Russian bear of disintegration and division," he said. "You will encounter the same defeat when your nation will fight in its own backyard the humble minority of Muslims who are stronger in faith." In July, a leader of an al Qaeda-linked group also denounced Chinese treatment of Uyghurs and threatened revenge. The leader of the Turkistan Islamic Party, in a video on Islamic Web sites, blamed the Chinese for "genocide." The speaker urged Uyghurs to "kill the Chinese communists where you find them, take them and besiege them and ambush them wherever you can." The U.S. State Department said the group has taken credit for violence in the past.